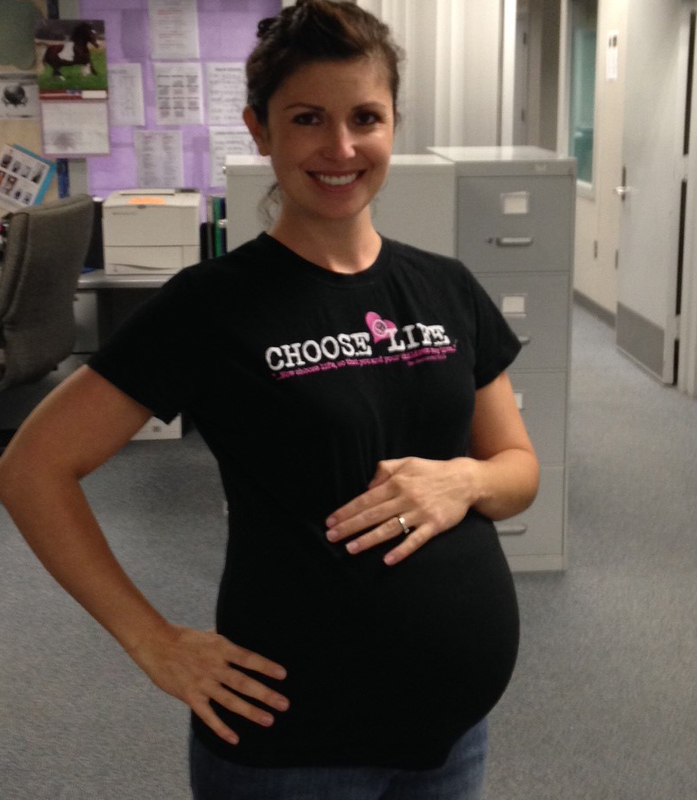 I proudly wear my Choose Life T-shirt today. After accumulated medical bills for doctor’s appointments, c-section, and hospital stay, as well as necessary purchases to accommodate the baby into our life such as baby supplies and a bigger car (4 kids in a 3 seated backseat is impossible), this will baby cost us over $14,000 by the time she leaves the hospital. My maternity leave will also cost us money. While I am allowed FMLA, this does not mean I get 100 percent of my pay. It will cost me 100 dollars a day to be able to stay 8 weeks with my baby (standard FMLA for c-section deliveries), costing us an additional $4000. And I’m blessed with a job that even offers that. I just have to pay for my substitute teacher. Then each month thereafter until she begins Kindergarten, once added day-care costs accumulate as well as cost for diapers, formula (if breastfeeding is not successful), solid foods, clothes, etc–it will cost an additional 600-700 a month for her. This is if she is healthy and does not need to go to the doctor’s. We do not qualify for government assistance so we have to come up with the money on our own. But just because we don’t qualify does not mean this money is just lying around. These costs require us to make sacrifices and cut out other expenses, and it involves having to work harder and smarter to increase our income. This is even after frugally piling up charitable hand-me-down baby items, and saving up left over baby items from our previous children (although not much from that because we gave most away after our vasectomy, having no idea we’d get pregnant again). This even includes utilizing health insurance. Add to this the added physical tole the necessary 4th C-section will be on my body and the possible consequences it may have on my health due to the risks: blood transfusions, bladder rupture, intestinal complications, infection, possible hysterectomy, etc. By many people’s standards, this baby could be viewed as “financially inconvenient” and a “health risk.” But we STILL choose life. We choose to see the blessing and not the hardship. We choose to give this precious human being a right to live. Because her life is worth it. Because God knit her together for a reason. We will be okay. We may not have fancy furniture. We may not have trips to Hawaii. We may have to clip coupons and eat out less. We may have a frontyard that stays unlandscaped for a few more years. Who knows. We may also not. Who can know the future. A fire could come again and burn our house down. My children’s books may take off once we publish and I may make more money than I ever had as a teacher. Who can know the future? But Still We Choose Life. And We trust that God will get us through anything that comes our way in the future because of that decision. We cannot wait for October 27th when I get to meet this little Scotland Amalia-Leme. We love her so much already. If you are pregnant and concerned about the financial risks and inconvenience of having a baby, please don’t choose abortion. Check out resources like Pregnancy Resource Center. They can offer free and discounted baby supplies, as well as free parenting classes to help you feel prepared for this change in your life. You DO have a choice– a choice for life. There are ways to take care of this baby. And any other mother who has chosen life will tell you, the baby will be a blessing and worth every sacrifice and change in your life. Or, please, please, please consider adoption. There are couples out there with so much love to give. My daughter and her husband are one of those couples. Because they are over 40 many mothers won’t consider them, which is sad. Please consider adoption.